In Part I of this series on utilities, I talked about consumable resources such as water, gas, electricity, and computing. We looked at their evolution from on-premise, consumer-generated and consumer-owned resources to resources available on tap from utility providers. Let’s now look at another class of utilities that connect places, people, and things. Humans began laying roads from the third millennium BCE. Silk road is a fine example of early civilizations developing networks and benefiting from it. 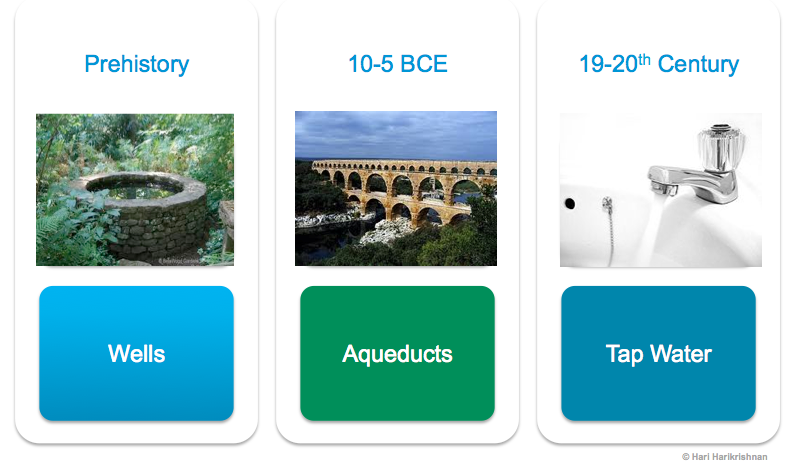 Building of these networks got a fillip around 500 BCE when Romans went on a road-buiding spree, connecting the vast empire from western Mediterranean to the Middle East. Large-scale human connectivity was established for the first time since sea faring began in pre-history. Over the next several millennia, humans enhanced the transportation network, progressing from seaways & roadways to railways & airlines. 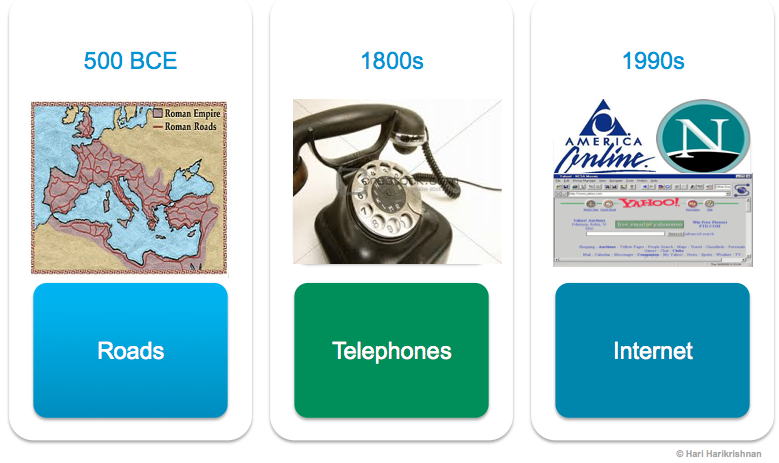 In the 20th century we also created other ways to connect people virtually – via telephones first and then by the Internet. Each of these communication/connection technologies is available as a utility. See the graphic on this historical progression. 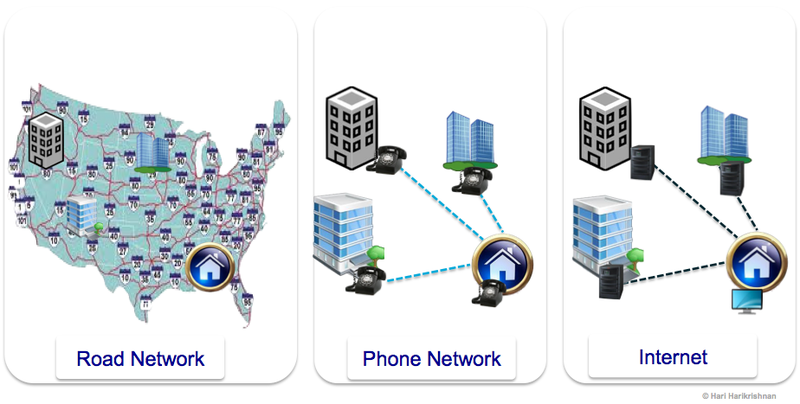 Telephone network and Internet are both virtualized forms of a transportation network. In other words, one could argue that transportation network was “virtualized” with the advent of telephony and internet. Commerce flourished over telephone before e-commerce scaled it further in the 1990s and 2000s. These networks serve similar purpose as well as suffer similar service disruptions like outages and capacity issues (“Road closed”, “All circuits busy, please try again”, “Buffering…please wait”). The graphic below shows the commonality across these utilities on how homes and businesses are connected by a transportation network, telephone network, or the Internet. There are significant differences between the utilities such as water, gas, electricity etc. and the utilities that connect. The former are consumed passively. Water, gas, and electricity are on tap literally, available at the flick of a switch from the where it pooled together (“Cloud”) to the user. On the other hand, transportation network or a communication network is consumed differently. We use it to get to some place – physically in the case of roads, virtually in the case of telephone and Internet. The utilities that connect require more active user interaction than the flick of a switch. It also transports people, objects or information bi-directionally – from user premises to other locations. We could consider water, gas, and electricity as passive utilities whereas roads, telephone and Internet could be termed active utilities. With the Internet, human interaction is faster as well as richer. The Internet has become a supercharged version of the previous virtual network, the telephone network, having evolved from a store-and-forward data communication (email) mechanism to offering real-time data, voice, and video communications. A key characteristic of the internet is that it is much more malleable compared to its predecessor network utilities. 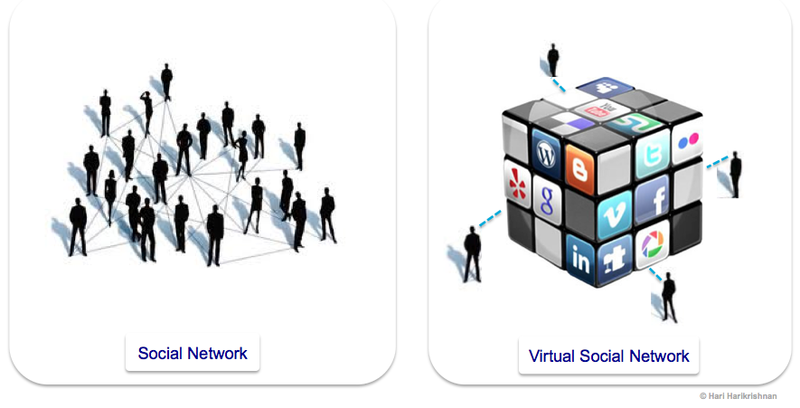 Interestingly, we now have the “virtual” location-independent social network that is built on top of this virtual transportation network as shown below. 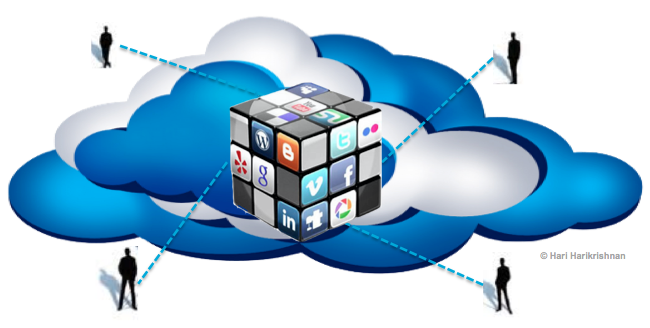 We can marvel at the virtues of the Internet and its evolution from email to web (readable & writable) and it being a key enabler of cloud computing. However, to me, how human interaction & collaboration has been enriched over several millennia by these networks and where they will propel humanity to is a more fascinating story. Later on, we’ll look at how Computing utility and Communication Utility came together to make creations like the Virtual Social Network possible and the implications to business and society from that combination.